NO PLACE FOR NORMAL: NEW YORK: 321. 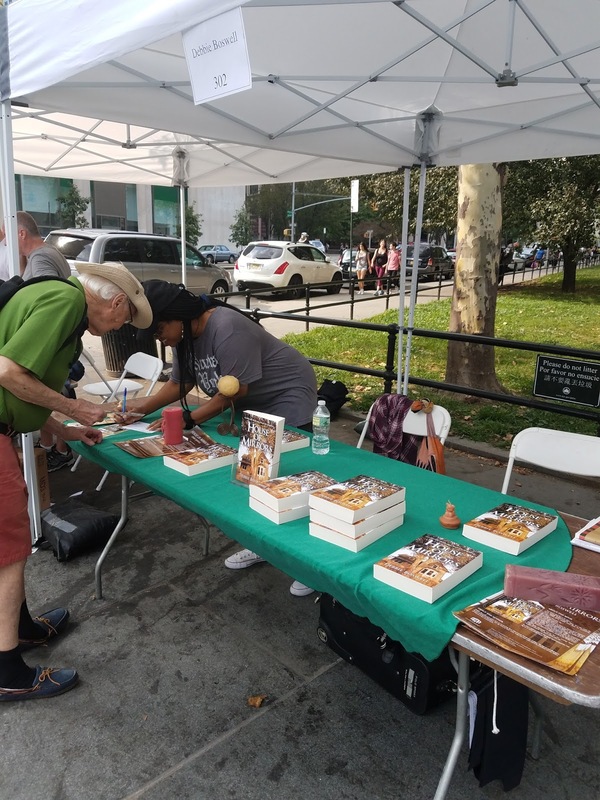 Brooklyn Book Festival vs BookCon: Where Should Indie Authors Exhibit? 321. 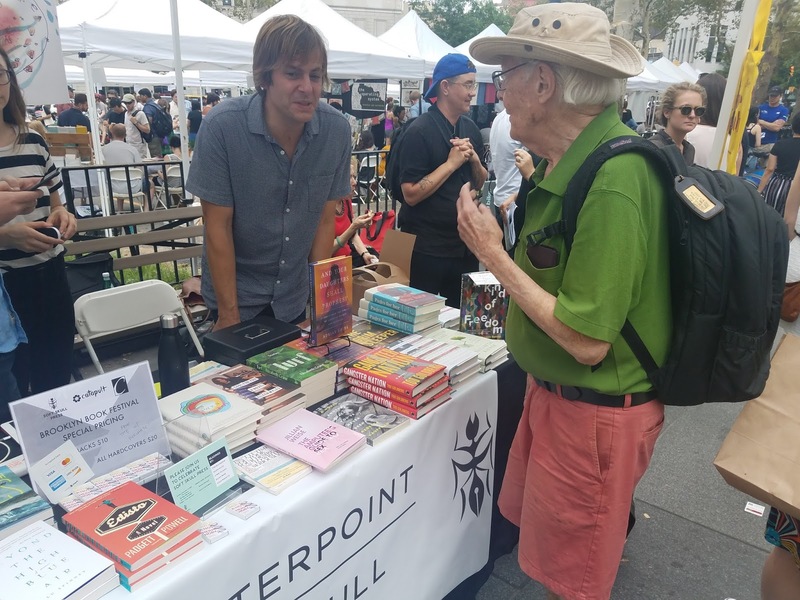 Brooklyn Book Festival vs BookCon: Where Should Indie Authors Exhibit? 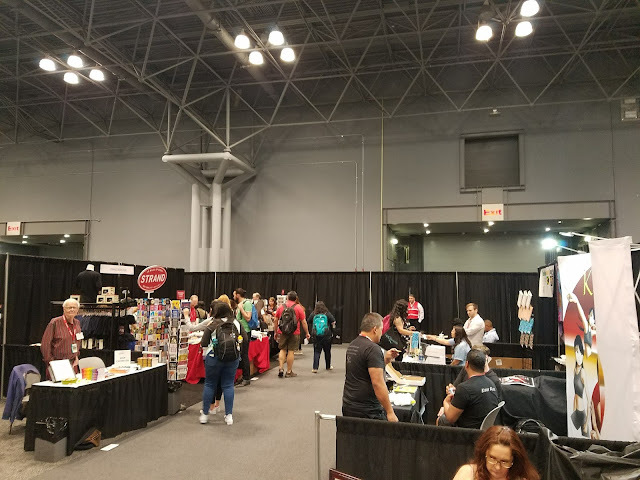 I’d never been to the Brooklyn Book Festival, but having exhibited at BookCon at the Javits Center last June (see posts #302 and #303), I wanted to sniff out the possibilities for exhibiting in Brooklyn next year. BookCon had been an exciting two-day experience, but not altogether satisfying. The BookCon exhibitors were small presses and indie authors who, like me, didn’t attend the two preceding days of BookExpo, when the book trade keeps the public out so it can talk to itself. Banished to a fringe location that didn’t get a steady stream of attendees, we BookCon exhibitors did our best to entice attendees and sell books, but I for one didn’t meet my sales goal, even though I sold 26 books in two days. Also, BookCon is decisively oriented toward female millennials, young women in their late teens and twenties, whereas my readers have proved to be older women and, to some extent, older men. So I wanted to size up the one-day Brooklyn festival as a possible alternative. One immediate concern: BookCon is an indoor event, so the weather doesn’t interfere, whereas the Brooklyn Book Festival is outdoors in the Borough Hall area and therefore exposed to all the rigors of the weather, though it takes place rain or shine. In addition, I had two specific queries: (1) Who are the attendees? A mix of all sexes and ages or, like at BookCon, mostly younger people, especially young women? (2) Where do they put the literary small fry like me? In some remote location, where few attendees venture? None of the big commercial presses would be there (though some of their imprints snuck in), but there are big small presses (Columbia and other university presses, Graywolf, George Braziller, New Directions, etc.) and small small presses (often called micro presses), and my concern was the latter. I knew from online info that small small presses and indie authors were distributed throughout. But I also learned that two of the areas – the 100s and 600s, meaning exhibitor stands so numbered (102, 103, 104…) – were somewhat on the fringe of the festival, which, since I might be put there, was worrisome. Armed with these concerns, I vowed to go there rain or shine, and go I did, on Sunday, September 17, which proved to be a pleasant, rain-free day. Surviving a chaotic subway system, after much confusion and delay I finally arrived at Borough Hall. Borough Hall, minus the book fair. Impressive. Borough Hall, an imposing Greek Revival building dating from the 1840s and once the City Hall of the independent city of Brooklyn, is rich in history and by itself worthy of attention. But I was there for the book festival, so off I went with my young friend Silas, who met me there, to see the 600 area close by, at the south end of the festival, where vendors’ stands topped by white canopies looked from a distance like rows and rows of tents. My immediate impression: though seemingly on the fringe of the festival, the 600s were jammed with attendees, the narrow aisles so packed that you had trouble seeing the books in the stands. “Are they just looking, or are they buying?” I asked two vendors, and in each case got an emphatically positive response; they were buying, and buying in quantity. And who were these attendees? All ages, sexes, races – truly, a good mix of the city’s population, and eager buyers at that. For me, a good sign, though I wouldn’t be sure until I checked out the seemingly even more remote 100 area at the north end of the festival. The Brooklyn festival at its most crowded. My BookCon aisle at a quiet moment, with me on the left in front. At BookCon there were too many quiet moments. And many, many more. I was grabbing bookmarks, business cards, and other portable mementoes right and left. And the 100 area, when we finally got there? Just like the 600 area, it was teeming with attendees. Vendors I regret having missed: BOMB, BookThug, and Grumpy Bert. Who knows what they were offering? I bought three books. At stand 227 I found Poets Wear Prada, a small poetry press based in Hoboken, N.J., whose name I love, and met a bearded older poet named Robert Kramer and bought two slender volumes of his poetry, Wordglass and Veer, both with attractive covers, for all of ten dollars; he was delighted to sign both. And at booth 302 I encountered an indie author named Debbie Boswell, who was selling her self-published novel House of Mirrors. When I asked her how she was doing, she confessed that her sales this year were scant, but added that that’s how it is in this game, one year good and the next one not. She was charming and upbeat, and when I came away with Silas, having obtained her e-mail address, I suddenly decided to give her a lift by buying her book and went back at once to do so; she too was delighted to sign it. Debbie Boswell signing a copy of her novel for me. A quiet (too quiet) location. Some stands announced their theme clearly. With Revolution Books (604) you knew at once what they were up to. At Verso Books (315, 316), one glance at their titles told you that they too were putting out radical literature, over one hundred books a year. I wasn’t looking for radical literature, but was glad that these two stands proclaimed their theme clearly, so I didn’t linger. One that tempted me was Freebird Books, a Brooklyn press at stand 511, whose staff emphasized that they were solely concerned with books about New York. Since New York is the subject of my fiction, nonfiction, and blog, I of course lingered there, examining their display of used books relating to the city’s history and culture, including some battered specimens that could serve as primary sources. Having too many books at home, I managed not to buy any, but I spent a good bit of time at their stand. Talking with Counterpoint Press, an independent California-based press, but here I didn't buy. A busy area, as seen in the background. Having exhibited at BookCon, I was keenly aware of disappointing vendors by lingering briefly, perhaps taking a bookmark or other memento, and then passing on; given the number of stands, I had to do this repeatedly. But I did interact with two other stands. At the Harlem Writers Guild stand (640) I heard an African-American woman explain how, a generation ago, their organization had been founded to give a voice to black writers ignored by the mainstream presses – an initiative that I applauded. And at the stand of Austin Macauley Publishers (121), a London-based press newly established as well in New York, I was invited to fill out a book submission form with my contact info, so they could follow up with me later. Rarely does even a small publisher invite submissions this readily, so later I checked them out online. What their website doesn’t make clear is that they offer standard contracts to authors whom they deem the most promising, and an alternative plan to others that involves the author’s helping subsidize publication. Some critics call this a disguised form of vanity publishing, which they emphatically deny. I shan’t pronounce upon the matter, but the mere fact of the accusation online dims the appeal of their offer. They did indeed follow up with a gracious e-mail a few days later, but I shall probably keep shy of them. Something was going on in front of Borough Hall, but we didn't investigate. 1. Announce your theme. With Revolution Books and Freebird Books I knew at once the kind of books they offer, and lingered at the one but not the other. Many stands displayed a host of books without helping me decide whether I should browse or not; often I passed them by. 2. Add color. Colorful book covers and signs get attention. I would even take it one step further: from the waist up, exhibitors should wear colorful clothing, whether shirt, T-shirt, or sweater. At all costs don’t be drab. There were a number of stands that were exactly that: drab. 3. Stand, don’t sit, when it’s crowded. Standing, it’s must easier to interact with people. But when it’s not crowded, rest yourself by sitting. 4. Smile. At several stands people sat passively, glum-faced, as if the world had passed them by. So I passed them by as well, without even glancing at their books. 5. Not too many books. Some stands displayed so many books that I was at a loss to find ones that interested me. Better to display fewer books and focus attention on them. To this rule there were two exceptions. First, stands that announced their theme, since this gave the guidance needed. Second, well-known small presses, since people would flock to them knowing what to expect. With visitors thronging every nook and cranny of the festival, how could a stand observing these principles fail to attract buyers? Yet indie author Debbie Boswell, graced with personality and the warmest of smiles, wasn’t doing well; why not? Probably because her stand, and the two on either side of it, weren’t on an aisle with more stands just across the way. Their stands -- 301, 302, 303 -- faced a large open area that didn’t channel visitors in their direction. So a few vendors may have the bad luck of being assigned such a location, and there’s little you can do about it. That and the possibility of bad weather – maybe a hurricane hitting on the very day of the festival – are two negatives in an otherwise positive set-up. And the books I bought? I have finished House of Mirrors and done a glowing Goodreads review of it. Also, I have not only finished the poems -- very sensitive poems -- in Wordglass and Veer, but have learned that poet Robert Kramer has had an interesting life: a vet, a Fulbright scholar, a teacher and much-published author and translator – which makes him well worth knowing. 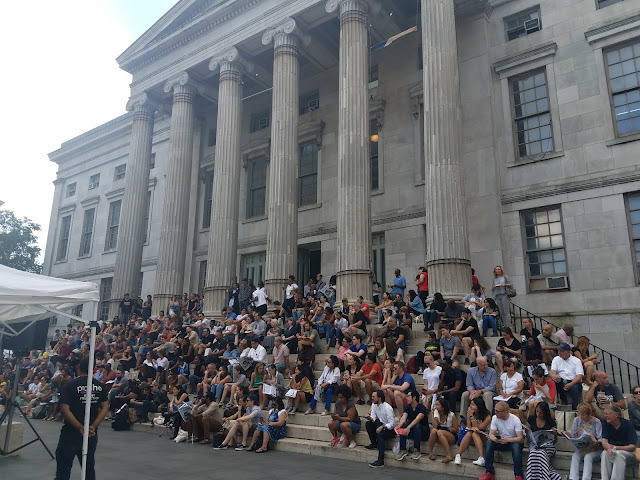 Here is my comparison of BookCon and the Brooklyn Book Festival, having exhibited at one and visited the other. BookCon is indoors, so weather shouldn't affect it, whereas Brooklyn is outdoors and exposed to the elements. BookCon is oriented toward female millennials, whereas Brooklyn attracts readers of all ages, including the older women (and some men) who buy my books. BookCon lasts two days, Brooklyn only one, so that Brooklyn vendors are putting all their eggs in one basket. BookCon in 2017 charged attendees $35 on Saturday and $30 on Sunday, whereas Brooklyn is gloriously free. BookCon charges exhibitors much more for a small booth for two days than Brooklyn charges for a small stand with a canopy for one day. BookCon gives exhibitors a lead retrieval device that lets them capture attendees' contact information, including their age range and the genres they're interested in, by scanning the attendees' badges; Brooklyn does not. BookCon representatives were available, helpful, and very patient both before the exhibit, during, and after it; as for Brooklyn, I can't say, not having exhibited there. BookCon 2017 grouped small presses and indie authors not attending BookExpo in a special section on the fringe of the exhibition floor that got uneven traffic at best -- sometimes lots, sometimes almost none -- rather than a steady flow, whereas Brooklyn mixes big and small small presses and indie authors throughout, so that in all areas (with a few exceptions) they get a steady stream of visitors. My conclusion: Look out, BookCon, for the Brooklyn Book Festival is a savvy competitor that attracts a wider range of attendees, admits them free, and charges vendors much less to exhibit. Will I exhibit at BookCon next year? That depends on several things, including above all the location (remote or more central) of the section. I don't criticize BookCon for its tilt toward female millennials; I simply question whether it's the place for me. Significantly, in her report on BookExpo and BookCon, Angela Bole, CEO of IBPA (Independent Book Publishers Association), suggested that BookCon was appropriate for those interested in reaching an audience of young adults or readers in their twenties, but otherwise she advised giving it a pass. Interesting, but I will decide for myself. And Brooklyn? I'll exhibit there for sure, though with a prayer for location on a crowded aisle, no hurricane, and a john within a short walk. But are these two huge book events competitors, or do they supplement each other? Will I exhibit at one or both? I have yet to decide. Meanwhile I hope that this post will also help others decide. As for how it feels to be marketing your books in public, see my next post, "Authors Are Whores." Coming soon: Authors Are Whores. What it's like to peddle your wares in public.